Steve – Thank you for being such a willing evangelist! Your unique style is a real blessing to the Church! I have two comments about St. Joseph that I wonder if you heard of before. One is that of Joseph being pictured of as an old man. This was assumed because if he was younger, that he would not have been as likely to control his sexual desire for his wife, Mary. (Some people cannot fathom the concept of self-control for sanctity, I guess.) The other idea was that Joseph had to die before Jesus began his public life because Joseph was actually the king in the Davidic line and that in order for Jesus to assume that title that his father would have to be deceased. Whatdayathink? STEVE RAY HERE: Not sure what to think. Joseph was a man like the rest of us and certainly had the same passions and need of self-control the rest of us pray for. We are not told whether he was young or old but in either case he would have had to live chaste in the state of life he was in. I have never heard anything about Joseph being king. There were lots of “descendants of David” which is why so many were in Bethlehem when Jesus was born. I have never heard that idea before but it seems very far fetched. By the way, Solomon was appointed king before David died though he didn’t take the actual throne until after his death though that was to keep others from usurping the throne. Hello, I was able to listen to some of the program about St. Joseph being the father of Jesus. Interesting how everything must be so explained. I made it a point to find the picture of St. Joseph you mentioned. Mary herself referred to him as His father, but we know from the Annunciation how this works. There are so many ways to consider this. The Trinity is a sign of family. Jesus, Mary and Joseph are family. Mary needed a husband to care for her and our Savior Jesus. St. Joseph had to be strong enough to do this job…to get them to safety in Egypt and back again so he could not be as old as some of the pictures I have seen. St. Joseph must have been so holy to be the guardian of Jesus and Mary. If Mary Mother of Jesus was preserved from any sin as not to be under the enemy’s power at any time, I would think St. Joseph would have been given special graces (similar to John the Baptist) to rise to such an important position as Guardian of the Holy Family. Can you just imagine how St. Joseph felt the first time he held the Savior in his arms on Christmas?! Here is another thought…after the Resurrection it states many were raised from the dead and appeared (to others). I think it is quite possible Jesus took St. Joseph’s body with his soul to Heaven at that time. The way Jesus loves His Mother I have no doubt of the love and deep devotion He has for St. Joseph…Family! Is there any info on the death of Joseph? I was raised a Catholic, but only realized 6 years ago that in fact, I come from Jewish lineage. There is no doubt that Jesus is our Lord and Savior. I was interested in the parents of our Lord. Mary’s lineage. Thank you, God Bless. STEVE RAY HERE: I have written about Mary and Joseph and the Holy Family and love to tell people all about them and their history while leading people through Israel. 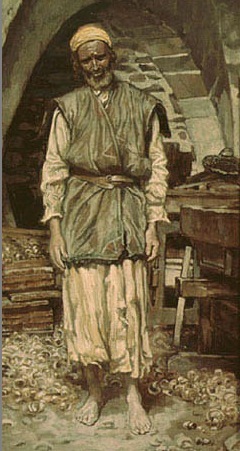 Joseph died after Jesus was twelve years old and before he turned thirty. We do not know how or exactly when. Our Basilica in Orlando has a life size sculpture you would love of Joseph and Jesus as a child at his work bench. Enjoy the walking and the running in Jesus’s footsteps. I’m sure he ran some time. God Bless.